Thousands of programmers want to learn Java fast, hands-on -- with as little complexity and theory as possible. 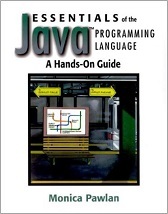 For them, Essentials of the JavaaA A Programming Language is the perfect starting point. Based on the author's wildly-popular web tutorial, this accessible, "learn-by-doing" guide covers all the fundamentals by walking through a simple program that gradually grows into a full-fledged eCommerce application which illustrates Java's most important programming techniques and concepts. In the first half of the book, developers master key essentials such as: building basic user interfaces; reading and writing data to files and databases; sending and receiving data across networks via RMI and sockets; compiling and running programs; and the differences between applications, applets, servlets, and JavaServer Pages. Next, Pawlan introduces more advanced concepts. In just 300 pages, developers get a complete, accurate, real-world grounding in Java -- all they need to get results fast, and shorten their learning curve as they move into more sophisticated Java development. For every programmer seeking to learn Java quickly and easily. Topics covered: Introductory Java tutorial, installation and compilation hints, Java classes, fields and methods; applets, basic Swing components and user interfaces, event handling, introduction to servlets and JavaServer Pages (JSPs), HTML forms, Java collections, Java file I/O, exception handling, security, permissions and policy files; JDBC and database basics, accessing data in servlets, Remote Method Invocation (RMI) clients and servers, Java socket classes, internationalization, packages, JAR files and deployment, introduction to object-oriented programming, and cryptography basics. Monica Pawlan is a Silicon Valley communications professional with senior-level, hands-on experience in technical writing and the writing for the web. My key strengths span writing for developers and content architecture. I have strong technical skills and learn new products and technologies by using them.